For example : If you can buy a place for $100,000 and get a mortgage of $600 including tax and insurance and then rent it for $700 a month you might assume that you're going to net $100 a month. You'd be wrong. However the actual cash flow situation for a rental can be far more complex. There are a variety of routine and potential costs with a rental that you need to consider if you're deciding if it is or isn't a good investment. Vacancies - One of the first mistakes is to assume that you'll get rent every month of the year. People tend to look at $700 in rent as equal to $8,400 per year and never account for gaps due to vacancies. However vacancies are routine part of being a landlord. Usually you should account for a vacancy rate of something around 5-10%. It varies depending on your market and 5% vacancy is probably a fair bet for most areas. With a reasonable 95% occupancy rate your $700 in monthly rent or $8,400 in gross rent is actually estimated at $7,980 a year. Of course you want to do what you can to minimize your vacancies but its not always possible to keep a place 100% occupied between renters. Higher Mortgage costs - The interest rates paid on rentals are generally higher than what you pay on a primary residence. Lets say you are buying a $100k house and putting 30% down. With a primary residence you can get a 3.75% loan with $324/mo payments. But if that same house was a rental then a mortgage would likely be 4.125% with a $339 payment. Thats an extra $15 /month. If the property is currently your primary residence and you turn it into a rental when you move out you can usually avoid a higher mortgage rate since you can usually keep an existing mortgage in place and convert a primary residence to a rental assuming you live there for a minimum time period. But even in that case if you ever want to refinance you'll end up paying the higher interest. Higher Property Taxes (possible) - In many areas home owners get a discounted rate on their property tax for their primary residence or people are charged higher rates for rentals. Its not always the case but you can often pay more for property taxes on a rental. For one rental my wife and I own, the property tax was about $1600 when it was my wifes primary residence and is now $2400 as a rental. We're paying about 50% more or $800 per year in taxes simply because its a rental. Higher Insurance costs. (possible) -Its also likely that your insurance rates could be higher with a rental. I don't know how much it will change or in which cases it does change. But its certainly another potentially higher cost. Utilities (possible) - You may or may not end up paying some utilities. For single family homes its more common for the renters to pay all the utilities. But in some areas it may be expected and typical for the landlord to foot the bill for some utilities. In multi-family units its more common for the landlord to pay common bills like garbage and water. Often times these bills do not have individual meters so you can't charge tenants individually for water. In the worst situation you may have shared electricity or heat services which essentially forces the landlord to pay for the electricity and/ or heat. You may expect that you can just raise the rent to compensate but it often doesn't work out that way. Renters in general tend to under appreciate and discount the value of free utilities and then often turn around and over use the free services thus raising your costs. Lawn Care (possible) - Depending on the property either the landlord or the tenant may be responsible for lawn care. Usually for multi-unit properties the landlord handles lawncare and its more common for the tenant to do it in a single family home. If you have to do the lawn care then you may pay a service and that can typically run $100 a month or more. You can save money by doing it yourself but then you have to buy and maintain your equipment and probably spend some gas for the mower. Snow Removal (possible) - In the Northern states its common to have snow in the winter and the landlord is often responsible for dealing with it. This can be another expense similar to lawn care where you either have to pay a service or spend some money to do it yourself. Repair and Maintenance - This category is a big unknown price. If you're handy and do a lot of work yourself you can minimize the costs. I spent $30 on a part to fix a stove which would have cost me easily $100-$200 for a service call from a repair man. Or I could have easily spent $300 or more to buy a new stove. Or I could have decided that I should get a nice stove and ended up $800 out of pocket. Now what happens when a fence breaks, the roof leaks, the furnace stops working or the toilet is running? All of those things are typical and common repairs. You can't know what the repair and maintenance costs will be but you should budget for something as they are inevitable and usually unavoidable. Damages (potential risk) - Most tenants do a good job of maintaining a rental and leave it in good shape. There are always the exceptions where tenants do damage to a property either through neglect or accidentally. You should of course get a security deposit from the tenant but it is quite easy for a tenant to do more damage than the security deposit will cover. And its not uncommon for a negligent tenant to leave on poor terms with unpaid rent as well. We had one tenant who left without even telling us and there were considerable damages to fix after the fact. Trash the carpet? Thats $1000 or $2000. Scratched up the hardwood floors? Thats another $1000. Unpaid electric bill and a fridge full of rotted food? A cat that doesn't know how to use its litter box? It all adds up. Even something simple like some picture hooks in walls can cost you a couple hundred to get fixed if you don't do it yourself. Wear and Tear - This is a category of cost that I consider separate from repair, maintenance or damages. Consider carpet. Even with careful tenants and no specific damages a carpet will wear out eventually. Eventually some things just get too old and need to be replaced. You don't really repair some items but just wait till they're worn out and replace them. Carpet, blinds, painting, all only last so long and will need to be replaced after a certain number of years. Lets say your carpet costs $1000 to replace and you expect it to last 10 years with reasonable use. Thats an extra $100 annual cost to account for. The roof or the fence will eventually wear out and those are hefty bills to replace. Legal and Accounting services (possible / optional) - Hopefully you'll never have to evict a tenant but eventually it is likely to happen. If you've never evicted someone before then in my opinion is best to hire a legal service to do it for you. If you aren't familiar with the eviction process then you can easily make mistakes that delay the process and ends up costing you more lost rent. It can cost a few hundred dollars to hire a service to do an eviction. Occasionally you might also get sued by a tenant, this too is rare but it might incur additional legal costs to you. You may also want to hire a CPA to do your taxes or if you do it yourself you may need to spend a few extra bucks to get a more advanced tax prep software package. Travel costs - Do you ever plan to visit your rental? The answer should be yes. That will incur some travel costs. One of our rentals is 25 miles away. Round trip that costs me about $8 in gasoline. Ideally your rentals are not too far away from you so it won't cost you much in travel costs to get there. But any trip will have an incremental cost. Supplies and misc. - There are also various little expenses that add up. Say your renter wants to renew their lease. That means you have to print out a new copy of the lease and mail them a copy. Thats 45¢ for a stamp and a few cents more for the envelope and print out. (optional) Property Management costs - Many people run their rentals by themselves, but often times people opt to hire a property manager. The property managers will charge fees anywhere from 6% to 15%. It varies considerably. That amount is taken off the gross rent. However you also have to be aware that the property managers often charge additional amounts for filling vacancies. I've seen managers quote numbers like 1 month of rent or $500 to fill a vacancy. You could quite easily pay 10% of rent plus $500 per year for property management. Of course this fee is optional and can be avoided entirely if you do all the work yourself. PLUS Depreciation - Its not all bad. One thing that can actually save you some money is depreciation of the property on your taxes. You can generally depreciate the value of the building over 27.5 years and this amount gives you a tax deduction. For example : say you bought a property for $100,000 and the land is worth just $10,000. The building is then worth $90,000. That means you can claim a tax deduction for depreciation worth $90,000 / 27..5 = $3,272 annually. Thats a pretty heft tax dodge. +/- Taxes - Depending on what your expenses and income are you may or may not owe taxes. Depreciation in particular can help get you a good tax benefit for your rentals. Consider that initial example I gave above with a $100,000 property that has a mortgage of $600 a month. You can rent it for $750. Thats a $200 monthly swing in expenses taking you from a $150 profit to a $52 loss. You thought you were going to make $1800 a year but now you're losing over $600. Net = loss of $2,260. This amount might give you a tax deduction of $2,260. You can usually claim up to $25,000 in rental income loses to offset other income but that is phased out if your income exceeds a certain threshold. So for high income earners this won't help you. On the other end, if you're low income you may have no tax liability or pay a low tax bracket so it won't be of much help for low income folks either. Most people will save 15-25% of this in their taxes for a net benefit of $339 to $565. Many other folks may see $0 impact to their taxes. State income taxes will vary considerably but there may or may not be some impact to the state bills too assuming your state has income tax. Do you Really Lose money? All of the above is about monthly cash flow. However you will have other long term impacts to your net worth. While you're making that monthly payment the principal of the loan is going down and hopefully the property is appreciating. So in the long haul you will see other financial benefits. In the example above you may be paying down $2300 in principal in the year and your $100,000 property may go up to 2% to $102,000 for a +$2000 increase in value. Thats an increase of $4300 in your net worth. Of course theres no telling if the value of the property will go up or down in todays market, you could also see it plummet 10% and lose you $10,000 on paper. Bottom Line : Determining the cash flow on a rental property is far more complex than simply rental income versus mortgage expenses. When considering an investment property don't forget to consider all the potential costs involved. I just read another misleading article about high paying jobs that don't actually exist. The piece in question is titled A $100,000 Factory Job. What's Uncool About That? from CNN Money via Yahoo. As you can see right in the title of the article they are talking about $100,000 factory jobs. But the problem with the article is that they don't point to any single such job making $100,000 or substantiate that $100,000 figure in any way whatsoever. "An aspiring machinist -- a popular factory job -- can start training at 18 and then do a one- or two-year manufacturing apprenticeship. In five years, he or she could be making more than $50,000. In 10 years, that could double to $100,000." Sounds great. But where is this $100,000 paying job? "Sedlak's [a company owner in Baltimore] top worker makes $30 an hour. And annual pay at his company ranges between $70,000 and $80,000 with overtime. In 31 years, only three workers have retired from his factory." I don't understand how they quote a guy saying his "top" worker makes $30 an hour or between $70,000 and $80,000 with overtime and then talk about people making $100,000. $30 an hour is not $100,000 a year unless you're working like 60 hours a week making overtime pay. But they say that pay at the company ranges between $70,000 and $80,000 with overtime. I don't see anything about $100,000 at all. Lets look at some real numbers. The BLS has wage figures for machinists. From that we can see that 90% of machinists make under $60,000. I see no evidence of anyone making $100,000 a year. Not even close in fact. Furthermore the outlook for the occupation in general isn't great. The BLS forecasts that jobs for machinists and die makers will grow 7% in the 10 year period from 2010 to 2020 which is 'slower than average'. Now its not as if I'm saying these aren't good jobs. Making $40-$60k a year without college is pretty good wage. But the pay is not $100,000 like the article claims. Theres a giant difference between claiming people make $100,000 and actually seeing wages up to $60,000 or $80,000 levels at the top. I mean would you like it if you were promised a $100,000 wage but actually ended up making $60,000? I think not. I don't know why news articles do this kind of thing, but I would challenge them to substantiate what percentage of machinists make $100,000 a year or more. I would hazard a guess that if any machinists make that much its a very small handful. Now of course theres always exception to the rules and with over 300,000 machinists in the nation I'm willing to bet that you could probably find me one or two who did make over $100,000. But if 90% of people make under $60,000 then its not realistic to act as if $100,000 wages are somehow common or normal. Why don't people want manufacturing jobs? The article also discusses the topic of 'why' people don't want to work in manufacturing. They talk about a negative media image of manufacturing jobs. They quote someone saying that 'public school' tells you that you have to got to college to succeed. In my humble opinion those are stupid reasons and far from the real reason. The primary reason people don't want to work manufacturing jobs is that the American manufacturing industry has been dying a slow and painful death for decades. The data in those two charts is from the BLS. 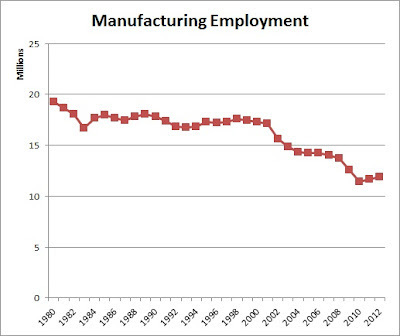 As you can see from the charts, the number of manufacturing jobs and the % of people working in manufacturing has been going down steadily in the past 30 years. You can't look at those charts and then tell me the reason people don' 'want to work in manufacturing is due to 'negative media portrayal'. 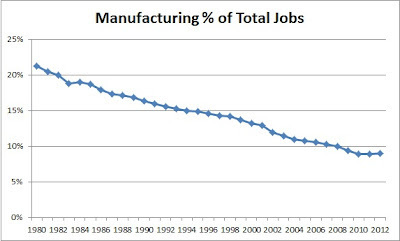 The fact is that manufacturing jobs have been cut steadily and people generally know better than to try and jump into a dying industry. Everybody 'knows' that manufacturing jobs are being shipped overseas to countries like China with cheap labor. Bottom Line : There are not $100,000 paying jobs in manufacturing. People generally don't look to join the manufacturing industry since the industry is shrinking. FreeMoneyFinance asks Which Is Better: Getting More or Paying Less? The other day I found an old receipt for some furniture I had bought in 1997. It was the furniture I bought for my first apartment I had when I initially started my current job. I paid $658 total for the furniture. I was wondering how much that might equate to today given the rate of inflation. 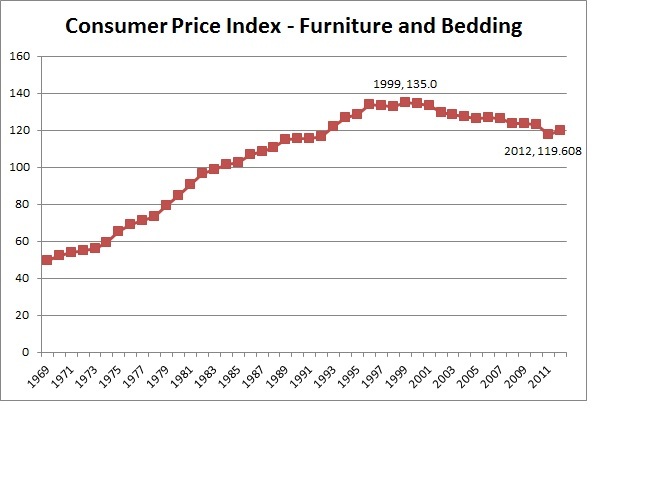 Somewhat surprisingly the cost of furniture is actually down from 1997 to today. Apparently when I bought in '97 I got in just before the peak. We still haven't recovered from the 'Furniture Bubble of 1999'. I got the data from the BLS CPI site. You have dig into the database to get the figures for specific index and I used the 'furniture and bedding' price index. As you can see the prices have been dropping since 1999. In that year the peak hit 135 on the index and today its down to 119. That equates to about -1% annual change or 1% deflation for the period from 1999 to 2012. This is a distinct change in price trends from what we saw the previous 3 decades. 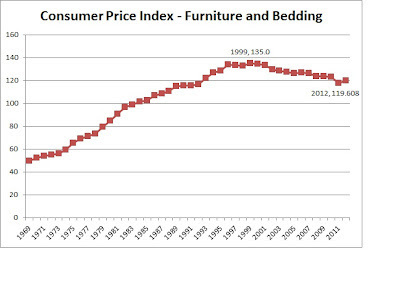 From 1969 to 1999 the price of furniture went up gradually as you would expect to see. In that 30 year period furniture costs rose an annual rate of about 3.4%. Of course I'm just jokingly calling this a 'Furniture Bubble'. Just because prices go up and then decline does not qualify as a bubble. It seems that sometimes people look at increasing prices and declare it a 'bubble' no matter the circumstances. I think this is an example of how thats not true. Rising prices alone don't equate to a bubble. Why did prices drop in the past 13 years? Your guess is as good as mine. I'm thinking its due to us buying more stuff cheaply made in China or via Ikea. Also, I didn't look into the methodology of the index so I don't know how exactly they are measuring the prices. Its possible that the products we are buying are more often cheaper quality as well. It also seems to me that every single furniture item I buy nowadays comes unassembled and there is certainly a cost impact associated with that. A friend of mine used to commute to our job site by "taking the long way around' as I'd call it. He wouldn't get off the first exit from the highway but he would instead drive on to the next exit then take a rural back road into work. He felt this was quicker and no doubt it was. Instead of driving 3-4 miles on the surface road and dealing with some stop lights, he could instead zip on down the highway then zip down the rural road. I recently tried his route myself and it seemed to be a lot longer. In fact I just checked it on Goggle maps and in fact he was driving about 2.2 miles extra. Thats actually quite a lot of extra distance if you add up daily round trips over a year. It may have saved him some time but it also cost him a lot of extra money on gasoline. Lets estimate that my friends car got about 25 MPG. Thats fairly average mileage for city/highway combined driving. At 2.2 miles per trip my friend drove an extra 4.4 miles each day. He would have to use about 0.176 gallons which would cost roughly 62¢ per day at a cost of $3.50 per gallon. 62¢ may not seem like a ton of money but if you do that for 250 days a year then it adds up to around $154 in extra gasoline. Thats not counting anything for depreciation on your car either, which is certainly an extra expense. Whether or not this is worth the extra cost really depends on how much time my friend saved and how much his time is worth to him. I give Google two addresses. One is my work site and another is a home in the area my wife and I would like to move to. Taking the A route on the freeway is the quickest but also the longest. Using route B would be a shorter distance but take 4 minutes longer. Basically we're looking at driving 1 mile further with option A versus spending 4 minutes more time with option B. Driving an extra mile costs you money but saves you time. Gasoline for that 1 extra mile will cost you around 14¢ assuming 25MPG and $3.50 per gallon. I would throw in another 10¢ per mile to cover depreciation on the car. You're looking at 24¢ cost to save 4 minutes. On an hourly rate that comes to a cost of about $3.60 per hour. If your time is worth more to you than $3.60 per hour then it makes sense to spend the extra 24¢ in driving cost to drive that further route on the freeway and save yourself 4 minutes. Of course the exact cost per mile depends on your car and the price of gasoline so it will vary quite a bit. Of course I wouldn't rely on just the Google map estimates of how long a route will take. The traffic congestion may vary a lot and could substantially impact the time a route takes. For example if I took that freeway route during rush hour then I could easily be looking at a 30 to 40 minute trip during a typical rush hour and if theres a traffic accident it could be far worse. On the other hand surface streets can get pretty congested around here too so I may wait as much or longer in clogged roads. You really have to test the traffic patterns yourself to tell how long a route takes. How you value your own time depends on your situation. A highly paid doctor should certainly value their time more than $3.60 per hour. But if you're broke and struggling to make ends meet then driving a few minutes more to save 48¢ a day is probably worth it, even though its not even minimum wage rate. Amazon is giving out yet another free $2 MP3 credit. For this one you do have to send a tweet about Amazon. The Amazon page says : This credit can only be used towards MP3 purchases and will expire at 11:59 p.m. Pacific on July 27, 2012. - - This article may contain referral links which pay this site a commission for purchases made at the sites. 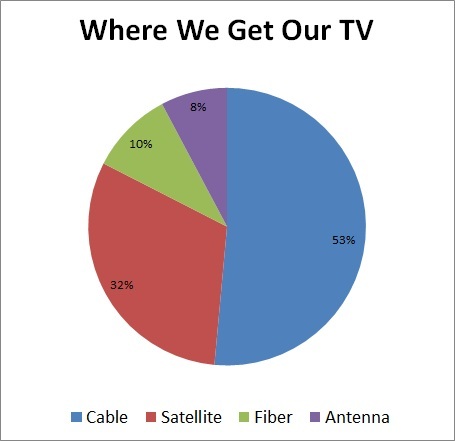 What Percent of Homes have Cable, Satellite, Fiber or Antennea only? Used to be that there were only 2 options for TV. You could use the bunny ears antennae or you could pay for cable TV service. Many markets now have multiple choices for pay TV. I could get cable from Comcat, fiber from the phone company or satellite service from DISH or DirectTV. Since the Satellite companies came around they have steadily eaten into the market of the cable companies. The phone companies have also gradually been gaining customers. Today the cable companies are holding onto a slim majority of the market. I found the data from this 2011 article by the Consumer Electronics Association. Their data is from 2010 but this is the latest source that I could find with the breakdown. Cable means a traditional cable TV service which has a copper wire that comes to your home. Satellite is either DISH or DirectTV service via the small satellite dish on your roof. Fiber service is the fiberoptic service from a telephone company like Verizon or AT&T. The figure for antenna is the houses that only have antenna. My father and uncle are in that small minority since they don't watch much TV and/or they are both cheapskates. As far as I can think, everyone else I know has some form of pay TV service. One of my friends only has cable TV because having the 'basic' service makes his internet service via Comcast cheaper or maybe it was that he got the cheap TV package essentially for free if he had Internet with them. If you do the math you'll find that those numbers add up to 103%. Thats because apparently a few households have multiple pay TV services. I would guess some of the people with more than one pay service do so to get programming only available on certain providers. Other people may have unusual circumstances that warrant more than one pay service, like for example they may have signed up for minimum cable TV service just to get a good price on internet via cable plus satellite service for their television. But thats just guesswork, I don't really know why people would have multiple services. The CEA report also has data going back year by year from 2005 to 2010. Whats interesting to see is how the market has changed in just 5 years. The telephone companies have grabbed 10% in just a few years. Satellite has gained almost as much. Cable has lost a similar chunk of the market. Interestingly fewer people in '10 had antenna only service compared to '05. My suspicion may be that was partially due to the digital transition that happened which made some peoples old non-digital TVs obsolete and might have spurred them into getting a pay service. But thats just a guess. FreeMoneyFinance raises some interesting Questions on "Showrooming"
Free 156 page book of useful consumer information published by the U.S. General Services Administration, Federal Citizen Information Center. The book is available at the publications.USA.gov site. The book is full of useful information. Some of its pretty basic stuff, but some of its more detailed. There are also a lot of useful weblinks to useful resources. Why Won't Comcast Just Sell Me the 16 Channels I want to Watch? For the 80+% of households in the US who have some form of cable/satellite television it has likely occurred to you that most of the channels you pay for are a "load of garbage". If you're like most people you probably watch 5-20 channels almost exclusively and then ignore the other 100-500 channels taking up space in your programming guide. At one time or another most of us have had the awesome idea of simply being able to buy only for the channels that you want to watch and not paying for all the rest of that junk. Its an awesome idea right? Why can't I just pay for and watch ESPN, Comedy Central, Sci-Fi, BBC, Discover, AMC, HGTV, ABC, CBS, NBC, Fox, PBS and whatever else I'm forgetting that I occasionally watch? I mean if I pay like ... oh.. I don't know ... $1 per channel than thats going to be like $20 and right now they charge me something stupid like $70 or $80 for 250+ channels most of which I never watch. Brilliant, right? Why won't the cable or satellite TV people simply sell me the channels I want to watch individually in an a la carte system? 20 or so channels that we want to watch and delete the junk. If we could simply buy the channels we wanted for just $1 each or something then everyone would do exactly that and we'd all be paying $20 or so instead of $30-$100. The TV providers are not going to design their business so that all their customers will pay them a fraction of the amount they currently do. The cable and satellite companies know they are selling a lot of 'junk' channels mixed in large bundles along with several of the 'good' channels. This is intentional on their part. They can't get you to pay $75 for 5 channels you want to watch, but if they force you to buy 250 channels at a cost of $75 for all of them then you have no choice to buy them all in order to get the 5 channels you want. The TV companies don't want to offer a la carte programming because it would just end up losing them revenue. Another thing to consider is that the 'good' channels cost a lot more than the 'junk' channels. An al a carte system may not be as cheap as we imagine. Its not as if Comcast would bundle 250 channels for $75 and then sell those individual channels for 30¢ each. Individual channels are often more expensive than you might imagine. The 'junk' channels are actually quite cheap and the most popular channels are much more expensive. You might be able to get yourself the home shopping network for free but if you want the EPSN channels then that would likely cost $10-20 per month in an a la carte system. Don't think of the 250 channels you're paying $75 for as 30¢ per channel with a lot of stuff you don't want. Instead think of it as paying $75 for the 'good' 20 channels you do like plus getting 230 'junk' channels for free. Thats actually what it almost amounts to. To see how a la carte programming costs might end up working look at the c-band satellite programming. C-band is the old style large satellite TV dishes that you used to see often next to trailer homes in rural areas 20+ years ago. These are the 10 foot wide dishes that were somewhat popular in rural parts before DISH and DirectTV came out. Initially the old large satellite TV users got signals for free out of the air because they weren't scrambled or they used technically illegal descramblers. Later the satellite companies came up with ways for such large dish owners to buy channels legally. Today they have companies selling c-band programming subscription services in bundles or sometimes via a la carte pricing per channel. Think you can get BBC or EPSN Classic for 25¢ or $1 per month and maybe $2 for Sci-Fi? Think again. The service Skyvision charges $5.99 each for those channels with their la carte purchase. Skyvision also sells several package deals which might include a bundle of channels that would work well for you and might be cheaper than one of the large bundles. Its not just the cable and satellite companies that bundle channels. The network owners also bundle channels. I remember when I had DISH network and got in a contract dispute with one of the network companies. At the time they were arguing over their contract rates. The contract expired before they came to an agreement and several channels were turned off for DISH customers. All of the channels were owned by the same company and that company didn't sell the channels to DISH individually. The owner of the networks bundled all their networks together and sold them to DISH as a bundle. Basically the TV network owners are doing the same thing to the cable and satellite providers that the cable and satellite providers are doing to us. Someday a service provider may come along what is willing to do true a la carte programming and settle for low revenues per customer and stealing customers from the cable / satellite providers. I doubt it will happen anytime soon if ever. Its more likely in my opinion that individual networks will start offering direct subscription services via the Internet. However I wonder if some of the existing contracts between the networks and cable or satellite providers might not allow for that. Plus you also have to consider that many networks are owned by big companies so they might sell their networks in bundles still. Yeah it would be a great deal for most consumers if you could buy the channels you like a la carte. Thats pretty much the reason the TV providers don't and won't do it. Entertainment.com coupon books are currently on sale for 2 for $10 with free shipping. After 17.5% cash back from Ebates your total will end up $8.25. The Ebates website says that the deal expires July 23rd and you do have to buy two books to get the $10 rate and free shipping. So you can't just buy 1 book for $5. Make sure to check out the Entertainment website to make sure the coupons are really a good deal for your area and your shopping needs. A lot of the coupons are buy-one-get-one-free type offers for restaurants I'm not interested in, but there can be some great deals mixed in. I pointed out late last year that the books go on sale in the summer. They keep proving me true by dropping the prices month after month. To get the cash back you need to be signed up with Ebates. Then simply go to Ebates to get the referral to the the store before you do your shopping. I also get a referral bonus if you use my links to sign up with Ebates. GoBankingRates is having a 'Personal Finance Olympics' competition where they pit various personal finance blog articles against each other in a competition. I'd appreciate it if you'd take a minute and vote for my entry. Thanks. When I was in junior high school I got free lunch for a while. I worked in the cafeteria to help wash dishes, but in hindsight I'm not sure if that was the reason I got free lunches or not. My dad didn't work much in the 1980's and we had relatively low family income. I may have been benefiting from the government free lunch program. Free or reduced price school lunches at our nations public schools are part of the National School Lunch Program. See NSL fact sheet You may be surprised how many families qualify for free or reduced lunches. Today a large percentage of families with school age children can qualify for free or reduced lunches. I looked up our local school and found that 55% of the students are eligible for either free or reduced lunch. Another school in the city has 88% of the kids who qualify. Our county has median income that is just about the national average so this is likely not unique. Note these are not the official numbers. I don't know if they've yet defined the rates for the 2012 - 2013 school year. But it will probably be the figures above of relatively close to them. As you can see in the above table a family of 4 could qualify for reduced lunch with a family income of under $42,000. I would guess that 25-50% of families with school age children qualify for at least reduced lunches. I'm not sure on the statistics cause its hard to find family income data distributions specific to households with children in school. I expect that families with children in school are lower income than older families in general as people usually have peak incomes later in life. Don and Peggy are both students in marketing at the local state college. Tuition plus books and fees at their college runs a pretty reasonable $10,000 per year. Room and board cost another $8000. The total cost is $18,000 per year. Don works part time during school at a car lot and gets whatever work he can in the summer. Don's work income covers about $8000 of his costs plus he gets a grant for $3000 a year. That leaves $7000 that he pays for with student loans. Don will graduate with his marketing bachelors in 4 years and he'll have $28,000 in debt. Thats a pretty average sum of debt for a new graduate nowadays. Peggy on the other hand hates the idea of student loan debt and has worked 30-40 hours a week as a secretary most of the time and only takes part time classes most semesters. She is paying for all of the school costs out of pocket, mostly by working more. Peggy also gets a $3000 grant but she has no student loans and pays the remaining $15,000 from her wages. Peggy averages 2/3 credit load and will take 6 years to graduate but she'll have no student debt afterwards. Don and Peggy are both very talented and get great grades. Peggy has to work harder due to her work schedule and Don has more time to study but they both do pretty well in school. Upon graduation they both can look forward to decent paying jobs starting at $45,000 per year. Don graduates two years before Peggy and he fixes himself a budget of $25,000 a year to live off of and then puts the rest of his money after taxes towards repaying his student loans. In two years Don has his student loans paid off in full at the same time that Peggy graduates with no debt. At age 24 Don and Peggy are both employed full time with no outstanding student loans. However Don has two full years experience and he's had a higher standard of living for those two years while working. When I've been to Las Vegas it has always seemed that there is a lot of advertisement there for lawyers so I've gotten the impression that the city must have a lot of lawyers. Actually it turns out that the # of lawyers per capita in Las Vegas is actually below average for large metropolitan areas. There are 3500 lawyers in LV and the population for the metro area is about 1.9 million. Thats about 1.8 lawyers per 1000 people. DO you see a lot of TV ads or billboard ads for lawyers in your city? Does it seem that there are a lot of lawyers around? Whether or not you think there are a lot of lawyers around may or may not be the reality. So what cities have more and fewer lawyers? Its fairly easy to get a number for lawyers per capita. We just have to find the number of lawyers per city and divide by the population. I pulled the list of 25 largest metropolitan areas and their populations for 2011 off of Wikipedia and I got the number of lawyers per city from the May 2011 metropolitan area occupational employment and wage data from the BLS site. To make the numbers easier to digest I figured the number of lawyers per 1000 people. Note : I do not think this data really MEANS anything. I'm not trying to imply anything or show anything or prove anything. Its just data. This information is probably only useful to resolve bar room bets. The figure on the right is the number of lawyers per 1000 people. For the 25 largest cities, the median is 2.3, the average is 2.5, the high is 7.2 and the low is 0.5. Not surprisingly the city with the most lawyers per capita is Washington D.C. There are a lot of legal fields represented in Washington. Most of the lobbyists and government law makers are lawyers. After D.C. the highest grouping is in New York. The lowest concentration is 0.5 in Riverside. However that is a misleading number. Riverside is about 50 miles East of Los Angeles and is effectively a suburb of L.A. I don't know if Riverside area is a suburb exactly but my understanding is that a lot of people live in the Riverside area and commute into L.A. Does this mean there are too many lawyers in some areas? No I wouldn't conclude that. I don't have any reason to think that New York has 'too many' lawyers and that San Antonio has too few. I would assume the number of lawyers is generally based on the demand in each city. Other than the fairly obvious for why D.C. has a lot of lawyers, I don't know why individual cities or states would have more or fewer lawyers. I would guess that it has to do with the system of laws in each state more than anything. Despite what we see on TV, I don't think most lawyers run around chasing ambulances or filing multi million dollar frivolous lawsuits. I would imagine that most lawyers are engaged in mundane things like real estate law, reviewing business contracts, handling estates and probate and stuff like that. So what does all this mean? Nothing much as far as I'm concerned. I suppose if you're working on a law degree that you might consider this kind of data to determine where the jobs are. What would you do if I told you that I was making a 6 figure salary and I was surprised that the government wouldn't give me food stamps? What if I was sitting on a $500,000 house and had $500,000 in the bank and I was upset that I didn't qualify for a welfare check? What if I got mad that my unemployment checks end when I got a job? What if I retired with $2,000,000 in the bank and then complained loudly because the government wouldn't pay for my nursing home bills when I became ill? I think usually most people would consider me unrealistic and simply confused if I thought I ought to qualify for government handouts in those situations. We can't get a Pell grant cause we make over $100,000. The government won't give us any aid cause they say we have too much money. My son worked last summer and now he's being punished because they reduced his aid. People say stuff like this all the time with a straight face and honestly feel somehow as if they're being abused by the government cause they don't get a free check. Financial aid is need based. That means that financial aid is for people who have financial need. If you have a good paying job and money in the bank then you do not have financial need and you won't qualify for financial aid. Financial need does not mean that you need some money because you already spent all of your money. Financial need does not mean financial want. If you have a solid income and / or financial assets then you are able to contribute to your own college costs. Let me repeat this so it is emphasized.. .. Financial aid is for people who have financial need. Nobody is entitled to financial aid. Financial aid is a free handout from the government, its really no different than food stamps or welfare checks. Its not an insurance system and you didn't pay into the financial aid program. It doesn't operate like social security or unemployment benefits. Nobody promised that everyone would get free government money to pay for college. Some financial aid comes straight from the university. That financial aid is handled by the university based on whatever rules they feel like making. If you have a beef or complaint about the financial aid system that the university imposes then that is really a complaint about the university in question. This is particularly true about private universities. Its up to them to dole out their free money however they see fit. If you don't like it then go to another university. Most people DO qualify for tax credits or tax deductions. This is another form of financial aid for college. Whats the real difference between getting a $2000 Pell grant and getting a $2000 tax credit? Not much actually. Either way its $2000 free money from the government. It seems most people don't even consider or realize there are significant tax cuts available for college, yet this is free money that the vast majority of families qualify for. If you go to a public college and qualify for tax benefits as most people can then the government is paying the majority of your college costs. Go to a state college with a reasonable $7,500 tuition rate. You fill out the FAFSA and get a big fat 'denied' because you make a whopping $80,000 a year and you've got a few thousand in the bank. The government says you don't qualify for any aid. Oh no!! Why won't the government help you?!? Don't they know college is super expensive? Well in fact they do know that. The government pays 50% of the bills at that college via tax funds and grants. Tuition only covers 25%. The other 25% is generated by the college itself from misc. things and gifts. If the tax dollars went away your tuition bill would have to triple to cover the difference. Plus you qualify for a $2500 tax credit. Altogether you'll end up paying $5000 of that $7500 tuition rate and the actual costs for that college are triple that. You may not get financial aid but the government is paying 76% of the cost of your public college education. Normally when you sell a rental property the profit from the sale will incur a capital gains tax bill. Right now long term capital gains are 15% but are normally higher. In addition you may also owe depreciation recapture taxes. Selling a rental can incur a hefty tax bill. Thankfully there is a way to defer that tax bill if you are trading up and buying another rental property. A 1031 exchange can be used to defer the tax liability if you are selling one rental property and buying another rental property. 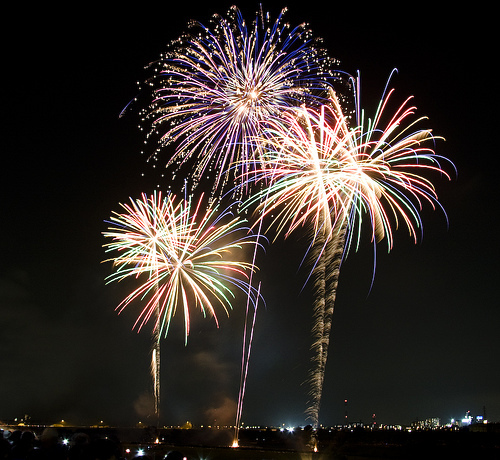 The 1031 exchange is basically an exchange of one property for another as defined by the IRS. This maneuver allows you to defer the taxes if you obey the rules of the 1031 exchange. 1031 Exchange is basically just the name for the process you use to satisfy the tax regulations in order to make the property exchange and defer the taxes. You might think of a 1031 exchange as a 'tax loop hole' but its not really a loophole, its a specific procedure defined by the IRS. I like to think of it more like an IRA rollover. Using a 1031 exchange will allow you to defer your tax bill when you sell one rental and obtain another. If you want to sell a rental and cash out then a 1031 doesn't apply. If you want to 'trade up' from one rental to another than a 1031 will let you delay the tax bill. You can not do a 1031 exchange on property that is your primary residence or that you intend to immediately resell. The exchange has to be between 'like kind' property which basically includes any real estate in the US. But you can trade any rental for any other rental OR any combination of rentals. You could sell a house and buy a duplex or sell two duplexes and buy a four plex. How do you do a 1031 Exchange? In order to perform a 1031 exchange you MUST have a 'qualified intermediary' (QI) handle the exchange. The QI is a bonded professional who acts as an intermediary and holds the money during the exchange process. Use of a QI is required by the IRS and its not optional. THeres no way around using a QI and they have to be independent. You also need to perform the exchange within specific time period. You have 45 days after the sale of the original property to identify the replacement and 180 days total to complete the exchange. These dates are rigid in general and you need to be careful to make sure you get the exchange done within the limited time period. In order to defer all the taxes the value, debt and equity in the replacement property should each be more than or equal to the original property. In other words you can't take a house with $100,000 market value and a $50,000 loan and then trade it for a $50,000 house you own outright. Why? Cause you're effectively using $50,000 of proceeds to wipe out that $50,0000 loan and you are realizing the gain so you'd owe taxes on that $50,000 amount. On the other hand you could go the other direction and exchange a home you own outright worth $50,000 for a new property worth $100,000 and a $50,000 mortgage. 1. Identify a Realtor who knows how to do 1031 exchanges. 5. Buy the replacement property within 180 days of step 3, the money then comes out of the account held by the QI. How much does a 1031 exchange cost? The 1031 exchange process is not free. You will have to compensate the qualified intermediary. I found one website advertising 1031's for $495 and another source indicated that costs generally range from $400 up to $1000. The QI may also keep all or a portion of the interest earned on the exchange proceeds while the exchange is taking place. When should you NOT do a 1031 exchange? No tax bill : Right now the capital gains rate for people in the 10% or 15% is actually 0%. So if you're in the 10% or 15% income tax brackets you can sell capital gains and pay $0 in taxes. Another situation where you wouldn't have a tax bill is if you are taking a LOSS on the property. That is not so uncommon nowadays with so many properties underwater. Tax bill lower than 1031 fees: If you have a marginal gain and a small tax bill then it wouldn't make sense to pay someone a fee to do a 1031 exchange to defer that tax bill. For example say you bought a property in 2003 for $90,000 and its now worth $93,000. You have a gain of $3000 and a tax bill of 15%. Thats a $450 tax bill. It wouldn't make sense to pay a QI $500 to $1000 to avoid a $450 tax bill. You don't want another rental : You wouldn't want to do a 1031 exchange if you aren't looking to trade up to another rental. You can't sell & buy fast enough : If you don't have any expectation that you can get it done within the required 45 / 180 day time frame then you may not want to attempt a 1031. Federation of Exchange Accommodators -- this is the industry group for the qualified intermediaries. You can use their website to locate QI's in your area. They also have a lot of info on 1031's and an FAQ. Field Guide to 1031 Exchanges from National Association of Realtors -- They have a ton of links to various articles and resources on 1031's. 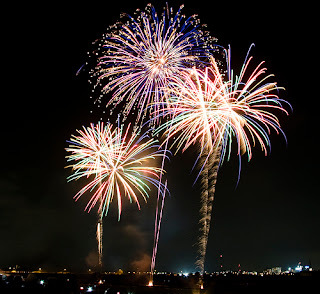 IRS publication 544 : Sales and Other Dispositions of Assets -- This is the general publication that includes sales of assets and covers the like kind transactions. Instructions for form 8824 and Form 8824 -- the tax form you file with the IRS to record the 1031. I saw 2-3 blog articles lately about the government estimate on how much it costs to raise a child. I found one article from CNBC titled The Inflation of Life - Cost of Raising a Child Has Soared discussed the topic. The title says the cost has "soared" and the article explains that the cost cited has "surged 25 percent over the last 10 years". Now I don't know about you but +25% in 10 years isn't exactly "soaring" inflation. In fact just simple math tells us its no more than 2.5% a year on average. Thats below what I'd expect for a normal inflation rate. I have no idea how the author of that article thinks this is "soaring" prices. But anyway thats a separate topic, the meat of the matter is the actual amount the government figures it costs to raise a kid. "The government's most recent annual report reveals a middle-income family with a child born in 2010 can expect to spend roughly $227,000 for food, shelter and other expenses necessary to raise that child - $287,000 when you factor in projected inflation." $227,000 total over 17 years comes out to about $13,350 annually. Thats a pretty hefty sum. Must be a lot of diapers and texting plan charges. That article was talking about the 2010 numbers from the 2010 report. However the government just put out a 2011 report this month. I first wrote up this article talking about the 2010 numbers cause I didn't see the 2011 data yet. Then I found the 2011 data and had to rewrite bits. So if I got some numbers mixed between 2010 and 2011 then thats probably the reason. Where does this number come from?? For that we need to go to the source. Who is in charge of determining how much children cost? Why the U.S. Department of Agriculture of course! 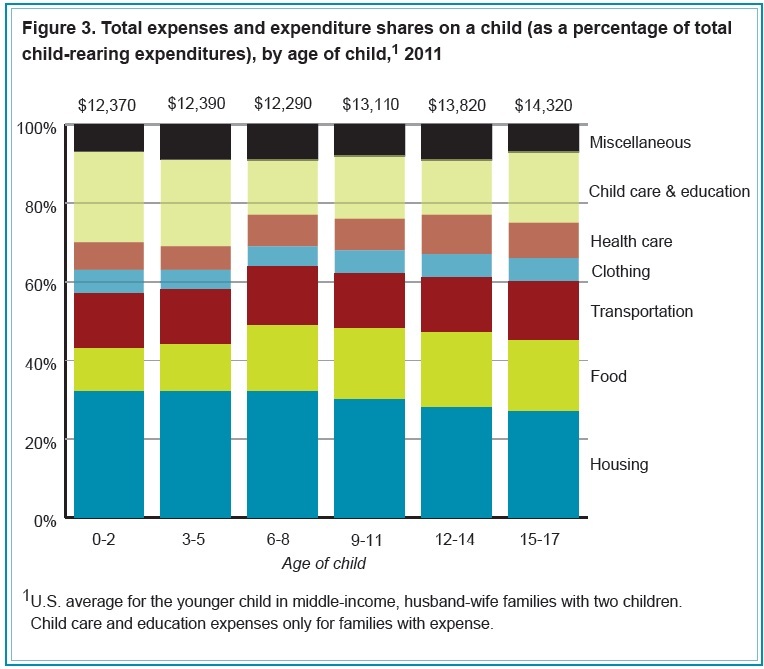 1) "Child-rearing expenses vary considerably by household income level." The range is pretty wide from as low as $8,480 among low income families up to to $23,690 for higher income folks. Expenditure Survey (CE) has been used as the basis for the estimates." The data they use is the Consumer Expenditure Survey. Thats the BLS survey about how much households spend. The data is really based on how much people spend rather than how much it costs. How much people spend is not the same thing as how much something costs. a) How much does it cost to feed a person? b) How much does an average American family spend on groceries and eating out? Do you think those are the same question? I do not. I assume the answer to a) would be a more minimal or basic cost and the answer to b) would be a higher than required amount. Our actual spending patterns include spending that is not necessary. For this reason I don't equate average spending to cost. They also break down the spending of different income groups. Lower income families spent $8,480 while more affluent families spent $23,690. What we're actually getting is not the cost to raise a child but the average spending per child for a middle class family. Here is a graph from the report indicating the % of total spending for each budget category from 2011. Age Cloting Health care Child care and education Misc. Note that this is for the middle income family with before-tax income: $59,410 to $102,870 (Average = $79,940) and both parents present. The 2011 report says : "As a proportion of total child-rearing expenses, housing accounted for the largest share across income groups, comprising 30 to 32 percent of total expenses on a child in a two-child, husband-wife family.."
Housing is a large portion of the cost to raise a child. You may not think about this really since you have to have a house and adding a child to the family doesn't really seem like it adds to your housing costs but it does. With more children you need (or at least want) more bedrooms. Those extra bedrooms require more space which costs more. The larger house has higher utility costs, maintenance costs, etc. It all adds up. They figure housing costs by the extra bedrooms required for children. Plus they then add in any associated costs for that bedroom like extra utilities, etc. They give a figure of $3,920 for middle income families. That comes out to about $327 per month for housing. That seems inflated to me. I don't think that going from a 3 bedroom 1500 sq ft house to a 4 bedroom 1600 sq ft house would really add $327 to the monthly costs of that house. Currently the median home price is around $160,000. You can finance that for about $900-$1000 monthly PITI, plus add in maybe another $100 for repairs and $300 a month for household utilities and you get say $1400 per month total for housing. In fact this is about the total housing spending for a middle income family according to CES. Should one extra bedroom account for 23% of housing costs? I don't think so. I'd assume more like 10-15%. Cut 1 bedroom and 100 sq ft out of a typical house and it won't cut your total costs by 23%. Repairs and maintenance won't go down much and at worst would be proportional to the amount of square footage for a bedroom. Same goes for utilities. I think its more realistic to figure an incremental cost per bedroom of closer to 10% of household spending or about $140 per month. I think the USDA probably overestimates the real incremental cost of housing a child by around 100%. Why does childcare and education cost $2,400 for your 15-17 year old kid? I'm guessing this is mostly for education. I know that there are some costs for k-12 education that parents carry like fees for sports or clubs, but I don't imagine the average runs north of $2000 a year for middle class families. Yes I do realize some families do spend a lot of money on sports but that is not so common that the average would end up at $2400. I suspect this may include the cost of private education spent by some families. I assume that CES data would include that cost in family spending survey. About 40% of the food spending in the CES data is from eating out. Otherwise families often aren't particularly frugal in their food spending. I don't think that the figures cited are particularly high and I dont' doubt those are the typical averages, but they are higher than what is really necessary. Does it Really cost $1690 a year to drive a baby around? 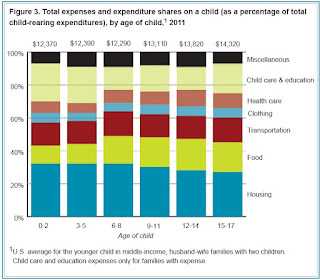 The USDA figured transportation costs for children as a % of total household transportation spending. 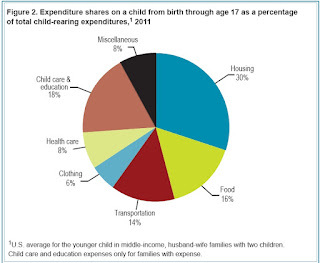 The 2010 report says "For a child in a two-child, husband-wife family, the per capita method (factoring in only family-related travel) resulted in approximately 15 percent of total transportation expenses being allocated to the child" So roughly speaking they're assuming that if a family spends about $10,000 on transportation then 15% or $1690 of that is due to the child. If you have to drive a baby across town to child care then I guess it could add up to that amount. But I think this is a pretty inflated number that probably over states the amount children add to your transportation bill. How much do you want to spend? Seriously theres no single right answer to how much it costs to raise a child. There are many variable expenses and some are optional entirely. I don't think the USDA measure is really wrong, it is just answering a different question. They answer the question asking "how much do average Americans spend". Thats useful to know but its not really the same as answering "how much do children cost". I think the USDA gives you a ballpark figure that is probably higher than necessary. You can certainly raise children on much less than the $234,900 total they figured. Poor people do it all the time. If I were to throw out a figure I would guess that the USDA number is probably inflated by around 50-66% give or take. I think a figure of $8000 or $9000 per year is probably more realistic and reasonable for a fairly good baseline spending amount. However this is just a pure guess on my part. The amount you can spend varies greatly. Past basic costs for food, clothing, shelter and medical care it truly does depend on how much you want to spend more than anything. Recently I bought my wife some perfume on Amazon as a gift. Unfortunately shortly after I made the order I noticed that my wife actually still had a nearly full bottle of the same perfume in the other bathroom. Oops. I thought she was out but there was a 2nd nearly full bottle I hadn't noticed. I tried to cancel the order before Amazon shipped it but I was too late. Also for some reason they didn't ship it via 2 day shipment which we normally got via Amazon Prime. About a week later the perfume arrived so I went to the Amazon site to check about the return process. "For safety reasons, items that are classified as hazardous materials or use flammable liquids or gases cannot be returned to Amazon.com. Customers should dispose of hazardous materials according to Local, State and Federal regulations. Customers should contact their local government or local waste company for directions on how to dispose of Household Hazardous Waste. " Dead end. No button to push to proceed. Special Shipping Information: This item is non-returnable and is not available for 2-day shipping due to additional shipping requirements. See details. Clearly I didn't pay attention and I failed to read the notice that the perfume was "non-returnable". It also clearly explained why they couldn't do 2 day shipping. I wouldn't have guessed that you couldn't return perfume. But now I know. The lesson of course is simple : Make sure to read policies when ordering items online.